What a fun way to anticipate or remember a holiday trip to the Caribbean or other formerly pirate-inhabited place! 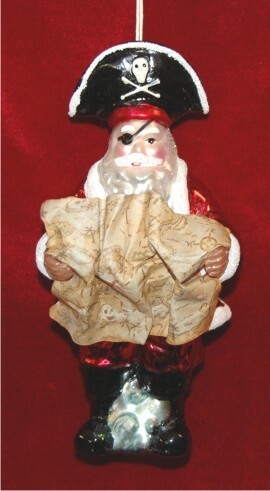 The Caribbean Travel personalized Christmas ornament delightfully depicts your favorite jovial fellow as a pirate studying a map to locate and return stolen treasures, we assume. It's handcrafted from premium blown glass and painted entirely by hand in gleaming tones that will sparkle from your tree. This is one of our travel and beach ornaments personalized by our calligraphers, so include names, destination or a phrase and we'll hand letter them onto the travel for Christmas Santa pirate ornament for you or someone special.